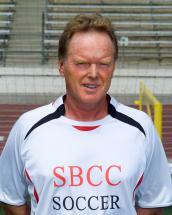 Coach Sisterson's updates on the SBCC soccer season and the players. ← First WSC Win for the Women’s Team!! MVP and Coach of the Year! With Only One Loss ALL Year…the Men Secure the WSC Title. Well Done! Jordan Tabor lofted in a 45-yard shot in the 68th minute Thursday night, lifting SBCC to a 1-0 men’s soccer victory that secured the WSC title. The Vaqueros, ranked No. 4 in Southern Cal and No. 7 in the state, beat Citrus at La Playa Stadium to complete a 12-1-1 conference campaign. It was their third WSC crown in the last four years and ninth overall. SBCC (15-1-4) won its last six games and is 12-0-1 in its last 13. Citrus fell to 4-11-5. “Hugo (Pizano, an assistant coach) and some of the guys said the keeper was off the line quite a bit, so I thought I’d have a shot and lucky enough, it went in,” said Tabor, after his ninth goal. “This is great for our sophomores. The Vaqueros will open the Southern Cal playoffs at home on Saturday, Nov. 19. SBCC outshot the visitors 10-1 in the first half and 21-7 for the game. Tabor, a freshman midfielder from England, leads the team in scoring with 27 points. He scored the game-winner with his left foot from the left side, just in front of his team’s bench. Sisterson will try to secure another WSC title on Friday when his women’s team travels to winless West L.A. If the Vaqueros win, they’ll complete an 11-1 season and earn a share of their first WSC championship. It would also mark the first time that one school has captured men’s and women’s WSC soccer crowns in the same year. The Men Advance to the FINAL FOUR!! The Men Are Moving On in the Southern Cal Men’s Soccer Playoffs! The Women’s Team Loses…It’s Down To PK’s. The End of a VERY Competitive Season!